Paint is Tamiya Light Metallic Blue with Duplicolor white stripe. Lyle sourced the decals from many places, including two different Slixx sheets. 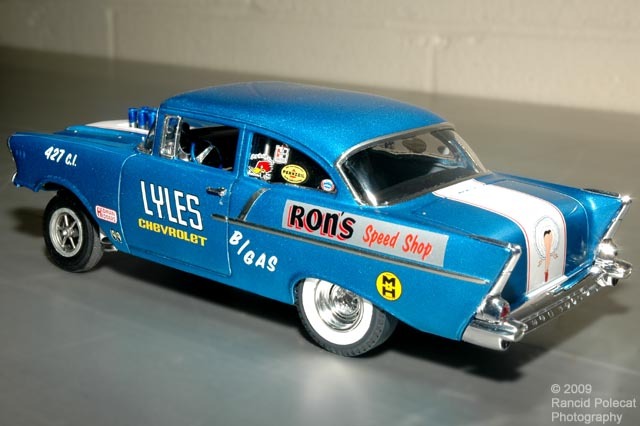 When he spotted one Slixx decal sheet with the "LYLES CHEVROLET" markings on it at a show, he had to buy it and knew he'd have to build a racecar with it some day. The rear decal came from an IPMS premium decal sheet. He didn't say, but the "Ron's Speed Shop" decals seem to be a nod to Ron Roberts whose many fine Gassers helped inspire this model. Here you can see the class-legal drilled rear bumper.